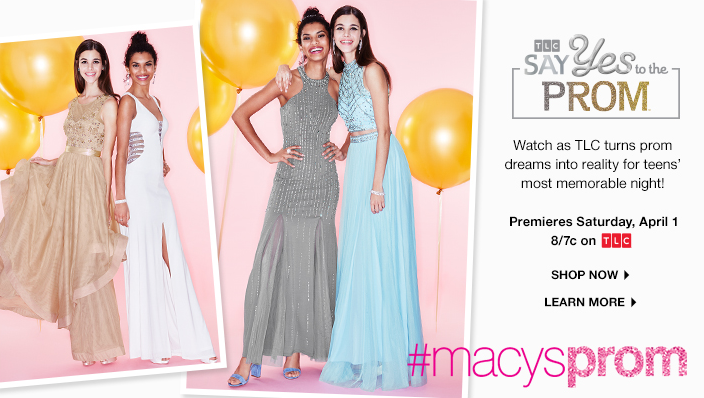 Prom season is upon us and the #MacysProm hashtag is all the rage because Macy’s is making Prom dreams come true! This month, tune into TLC and watch as prom dreams are turned into reality for teens’ most memorable night. But how can you (or your favorite high school student) recreate these magical prom moments without the show? It all starts with the perfect dress. This year, the hottest prom outfit is the 2-piece dress, like the one pictured above from Say Yes to the Prom. Shop all Macy’s Prom dresses under $99 here. Want to save even more on your Macy’s Prom purchase? Buy online, pick up in-store and get an extra 20% off on your next store purchase! Now you can be the Belle of the ball even on the most basic budget. With Macy’s Prom shop, you’ll find everything you need to have the night of your life. And don’t forget to tag those prom photos with #MacysProm so we can see how stunning you look on your special night.